No matter our age, there is no such thing as “too many” makeup tips and tricks. For one thing, a “great” technique shared by a friend may be a complete flop for your skin type, face shape, hair color etc. That’s where a little experimenting comes into play, along with practice using the advice that really works for you regularly. Before you even get into the concept of applying makeup, the phrase “know yourself” really matters from two perspectives. You want to wear makeup that reflects your personality, mood, and age but you also want those choices to accentuate the very best features you’ve got. Keep this in mind when trying some of the makeup guidelines herein. Beyond that strategy there’s age to consider – yes, it’s a nasty word but our years show up on our faces unless we’re very clever. There are some great makeup tricks that take years off your finished appearance. 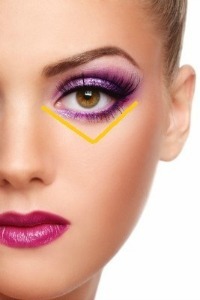 Let me give you an example for making your eyes standout more….. Even if you don't have dark circles, the skin around the eye area is very thin and with age, blood vessels tend to show through more, casting dark purple or bluish discoloration. Applying a small amount of concealer can help. 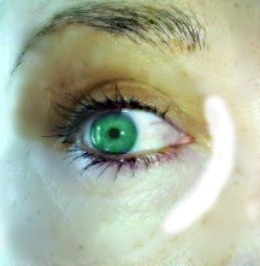 To get the best effect apply the concealer in a wide V formation as shown in the picture below. Another makeup tip is to take your concealer and make a line that goes from the top of your cheekbone, down to the tip of your chin and back up to the top of the other cheekbone. Make sure that line connects with the corner of your mouth. Blend it in. Now look at the difference in the visibility of your eyes. Line the upper lids and add non-clumping, volumizing mascara (brown if your hair is starting to gray) and they stand out even more……. Very simple and effective. For the smoothest and flawless look always use a primer on your face and especially around the eyes. Not only will it help your makeup stay put - it helps conceal any discoloration around the eye area. Also when you’re moisturizing the rest of your face, make sure to get some eye serum in those areas with creases and dark circles. Nourish your skin – it will shine with appreciation. In terms of color soft tones – neutral and pastel – are much kinder on aging skin. Plus it's so much easier to match them to various outfits and social situations. Shading offers other makeup tips and tricks particularly for those seeking a youthful visage. Anywhere you have harsh lines, use a lighter shade of foundation. Go just the opposite direction with soft line. This is a great method for giving yourself a face lift in sagging areas. If you’re looking for a little shine – that’s the time to reach for a bronzing agent. Note, use this conservatively. You’re not trying to look tan, but rather give your skin a healthy glow. 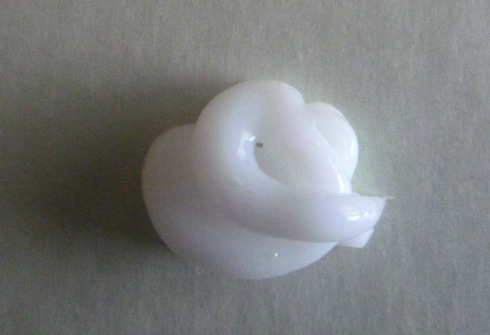 Illuminators offer similar results. Last but not least remember this mantra: moisturize, moisturize, moisturize. You’ve read it in 101 different articles, but even the best makeup tips and tricks fall flat on dry, flaky skin. If you use a moisturizer with SPF protection, all the better. When your skin is healthy, makeup works much better for achieving the desired results.